A move from one place to another is already a complicated, emotional, and could possibly be quite expensive. Whilst these issues are common, you might definitely don’t want to add another stress to an already intense relocation process. With an increasing number of people moving annually, there are some issues that arise from being scammed during the move. 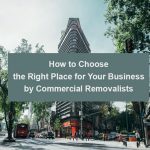 This issue usually starts at the process of choosing a removal company. Well, it’s really important to give an ample time in researching the right qualities of a moving service before choosing a removal company. Yes, the details that you could get will give you the better ideal. As you decide which one company is best to work with. Moreover, for you to avoid scams, here are the 5 indicators that you might need to check before choosing a removal company wrongly. Commonly, most reputable moving companies will only ask for a reasonable deposit to secure their services. Thus, movers are no different once they have completed their jobs and have transported all your possessions appropriately. They’ll then expect full payment when all is said and done. Moreover, any moving services firms that ask for a huge amount of money before any work has started, is a sign that something might be up wrong. And yes, it is true for any other types of service. Note that there are many scammers out there who ask for a large amount of payment. And sometimes the whole amount itself, only to run off with the money and never to be seen again. If they ask for much more than that and seems to be overly pushy about it, then you should probably look somewhere else. Well, it’s pretty obvious that a legitimate moving firm should always have a contract for you to be signed. This contract will mean to protect both you and the mover so that you’re both obligated to hold up your end of the bargain. This means that you agree to pay a certain amount for the specific services you ask for. And the same goes to the movers that agree to provide you with the services you ask for in a high-quality output. Remember that without paperwork or written documents on hand, it’s possible that the mover is up to something. Or worst case a certified scammer. Many scammers tempt their unsuspecting victims with the promises of a low price. Well, typically everyone wants to get a deal and shop around for the lowest price, that is commonly a practice. But you must think that sometimes paying the lowest price isn’t always the best way. This does not guarantee high-quality services. Extreme low-price offer that is too good to be true is a warning sign that something isn’t right. Well, in reality, there’s a plenty of overhead in moving. This includes equipment, gas, employee wages and other things. If the rate your removalists quote is barely enough to cover these expenses, then they might be out to scam you. Another strategy that most scammers use is quoting their client a super-low price. Yet, only to double or triple the price on the day of the move. And at that point, you’ll either need to pay or scramble trying to find another business relocator at the last minute. Which is typically a tough thing to do. Therefore, before choosing a removal company, make sure to check if they are giving you right and accurate estimated cost. In today’s trend, every enterprise has its own website where customers can easily access and check for review. Thus, if you’re choosing a removal company, make sure to check if they have a website otherwise then it’s a warning sign. Check if they have an official logo, actual physical address and check if the given address is legitimate. Doing this will help you learn a lot about the legitimacy of their trade. And if the agency lacks something important details, then you may want to call someone else. A professional office moving enterprise will have dedicated administrative staff that will take the call. And handles customer services that are part of the business. Likewise, when you do call, the person answering should respond with the name of the business. And answer your questions professionally. Hence, if it sounds like you just call someone’s cell phone, it’s possible that they are not legitimate as what you think. The bottom line here is that there will always be scammers out there that are going to take money from those who least expect it. And for you to avoid becoming their next victim, you should make sure you are armed with enough information. About what suspicious moving services look like before choosing a removal company for the job. In whatever moving services or business storage service you need, you should be more aware that at some point there are people that will possibly scam you. Thus, better be really careful before taking their service offer. Take your time and do some research. Looking for a reliable business relocation services? Business Relocation Service is an office removalist Sydney company with a reliable and high-end quality of move and removal services. And our rates are reasonable. Give us a call today let’s schedule together with your office removal or relocation plan. You may also visit our website for more details. Also, are you certain that your relocation site will work for you? Then double check and find out! Read our article: Office Removal Services Tips: Ensure the New Location Is A Win.